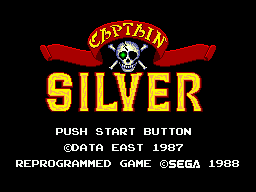 Captain Silver (キャプテンシルバー) is an arcade action game developed by Data East in 1987, which was ported to the Sega Master System by Sega the following year. The player assumes the role of Jack Avery, an adventurer in search of Captain Silver's treasure. The game is a platformer with emphasis on fighting enemies with a sword. The sword is upgradable so that it shoots stars, which can be bought in shops. While the Japanese and European versions of the game consist of six levels, the US version has been cut down to only four. It is also missing various enemies and bosses, and the ending has been replaced with some scrolling text. The reason for these cuts may have been to fit the game on a 1-Megabit cartridge instead of a 2-Megabit, in order to reduce costs. Main article: Captain Silver/Magazine articles.